Last Friday I finished my internship so what better way to celebrate then get back to London for the Notting hill Carnival. I went with my Oxford gal pals and had an amazeballs time! First things first, this is what I wore…. 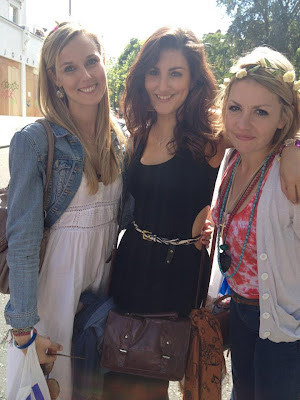 We all went to the carnival for my friends 21st and she wanted us to dress in 1960s hippie style for the day. I don't think I really adhered to the spec but YOLO. The amount of Levi cut offs we saw was crayy, even though I proudly own a pair and rave about them on this all the time, its no fun when everyone else is wearing the same thing as you and I'm getting pretty bored of seeing arse cheek from shorts everywhere I look. I was gutted because we actually missed the floats…I think we must of gotten distracted in a pub or something…. Eek. Anyway...after a few hours in the pub we wandered around and found a music stage and got on it. We were mega lucky with the weather, it was boiling all day! I really wishes I'd have gone back on the Monday, deffo making it into an annual thing. Did any of you go to carnival? In other news I mentioned I have finished my internship and am now a free laaddddy of leisuuuuree! LOL JK, Im working to get some dollar bills before unayyy. I'm going to do a post about my internship when in the next few days so keep your eyes peeled and watch this space! Next week I go on holiday so I'm going to make an extra effort to blog errryday before wednesday! :) I love love love hearing feedback so please don't be afraid to lemme know what ya think! Karl VS Pippa...who you backing?